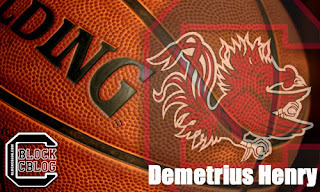 Demetrius Henry comes to us from Brandon, Flordia. He will play a big part of this incoming 2013 class. Henry belives in this program and believes in what Frank Martin is building at South Carolina. He is every bit of 6' 9" and will play as a power forward. Henry knows coming to South Carolina means doing something that has never been done before, it's a challenge that he has chose to accept. 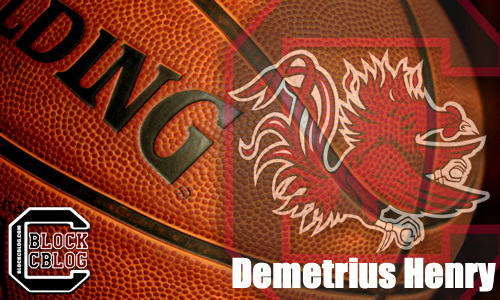 We are very excited to have Demetirus Henry as a Gamecock. Here at BlockCBlog we recently caught up with him to ask him a few questions. Welcome to Gamecock Nation and Welcome to The Block! BCB: We know playing for Frank Martin was a big reason for you choosing USC. What do you like most about Coach Martin as a person and coach? DH: He's a great guy, he knows what he's doing and he will make the best out of me. BCB: Carolina won only 4 SEC games last year. How important for you is it to help turn the Gamecock program around and take it to places it's never been? DH: It's really important, I'm looking forward to it. I'm going to be working hard and so will my team mates to take this team as far as possible. BCB: What's something funny or interesting that happened during the recruiting process? DH: At one point I felt like every school was offering me just because the next school was. BCB: We know you have a strong post game, tell us what makes you so successful down low and what part of your game do you feel is your strongest? DH: I really work hard and watch a lot of basketball, so I pick up on moves and put then in my game, the strongest part of my game is that I'm versatile. BCB: How do you feel about the other recruits coming into USC? We know you met Thornwell during your visit but is there anyone else you've reached out to yet? DH: I haven't had a chance to meet all the other recruits, except Notice and Theus Jr, but everyone says we're bringing a top 25 class so we should be good. BCB: Tell us about your official visit to USC. What was it like to meet all of the other coaches including Spurrier and what did you think of the facilities including the Colonial Life Arena? DH: Man the visit was great, I got a good feel for the campus. The faculties are top of the line. I'm going to love it. BCB: What is your number one goal next season? BCB: Do you have any nicknames, what do you want the fans to be screaming next year? BCB: Tell us about your experience in AAU, how much pressure did you get from your team mates to stay home? DH: AAU was great, getting to play the top competition, that's something I live for. And my team mates didn't pressure me at all, just want the best for me. BCB: What do you want Gamecock Nation to know about Demetrius Henry? DH: I'm ready to bring change! BCB: What Jersey number do you want to wear at USC?